I saw this t-shirt at Walmart for $4.98 last week, and bought it as a joke for my dear hubby. His famous line is…”Welcome to the Gun Show” as he flexes his muscles at our two grown-up 6 foot plus sons…LOL. So, when I peered at one of my favorite stamp sets, SU Guy Greetings, and spied the muscleman, I thought “PERFECT” for his t-shirt. Actually, I thought I would never ever use that one image! Just a CAS card using Typeset DSP inspired by The Paper Players # 248 Masculine Challenge and the Freshly Made Sketches #190 Challenge. 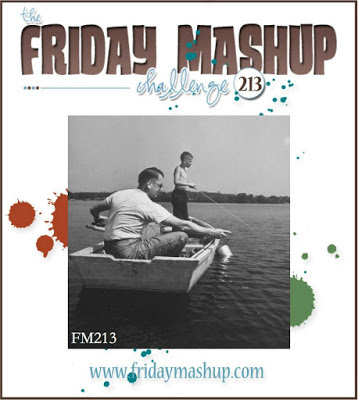 I am sharing it with the Friday Mashup #213 as well- a Father’s Day theme. Great masculine card and it looks fabulous in its monochromatic tones. Very clever to copy to central image onto the flag too!Thanks so much for joining us at The Paper Players and Freshly Made Sketches. Perfect all the way around!! Lol!! Love it!! Love that fun shirt !! Great monochromatic guy card! I love how you switched up the DSP in the background, instead of just doing one panel. I had to look twice and it! 🙂 Thanks so much for playing along at the Friday Mashup!